List & Label is a reporting component for developers and brings extensive and convenient print, export and preview functionality to your applications. The choice is yours: whether you opt for data binding or choose to work without a database, or whether you are developing a desktop or server/web server application, you can enhance your software by adding only a few lines of code (or none at all with .NET). This way, you include a host of reports and decide which data is used for List & Label while designing or exporting. List & Label makes it easy to expand to international markets and hone your competitive edge. Language kits, unicode support, and the localization of project files gear up your application for multilingual teams and international projects. The launch date for each kit depends on the release cycles and collaboration with partners. All available language kits are included in the Enterprise edition. Plus, they can be purchased as an add-on for the Standard and Professional editions. If you can’t find the language you’re looking for, please feel free to contact us. 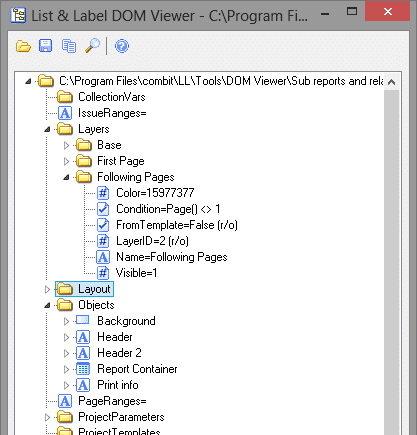 You can integrate List & Label into all DLL/API-compatible languages. If you can’t find the development environment you’re looking for in the list below, please contact us. DOM enables you to dynamically create projects. You can use your own project wizards, and a feature-reduced version of the Designer. What’s more, the DOM API allows you to define practically any property by code. DOM is particularly easy to use with .NET and VCL, and can be used with a range of other programming languages, too. Imagine what it would be like to have a project wizard that adapts project templates to the user’s requirements before the Report Designer has even opened. List & Label offers this functionality. Users can select the fields they require for an invoice from their database, and when they open the Designer, the invoice will be almost ready to go – with the address field and item list already filled out.